I exported it as a fbx file according to the zappar 3d guidelines. Re-Importing it in blender shows no problems, I can see my mesh and animation (no texture though? ), but in zappar it only shows the animated part, not the static mesh. So I can just see the lid in zappar, without the rest of the box. 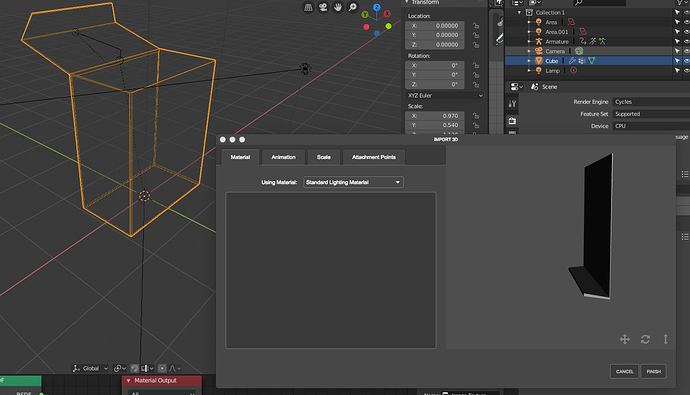 Exporting it as a .obj shows the whole mesh, but obviously without the Armature (animation) I need. This is how my hierarchy looks like in Blender, I select the Armature object (and/or the Cube object, tried everything) and then export it. Any tips and tricks? Is my workflow flawed? Hi, I think i can help you export your animation. thank you for your suggestion, but I don’t really wan’t to pay, I wan’t a way to make it myself. I’ve used another 3D Modelling Software for my task, but I would really prefer a way to make it happen with blender, as this software is free. The model is not complicated, it’s just a box with an inside and outside material, I can open it in other software with no problem, but zappar just shows the animated part, the lid of the box. I already tried exporting with the new blender beta, but to no avail. Are you exporting as one object? I found for something like this it was easier to make 2 models and add them to the same symbol. Then use your own time line. That’s actually quite a genius idea, thank you for that! Animating it in Blender is a more elegant solution, but as long as it works I’m happy with it. I have to look more into pivots in zappar studio to make it work. Thank you for your kind offer mate, really appreciate it! Still, I want to do this by myself, this just HAS to work, I guess my workflow is somehow flawed. It might just be a case of scaling each object until they look correct - this has worked for me in the past although it’s not an exact science for obvious reasons.